If you drive a pickup truck then you should understand the importance of having the best truck tires out there. 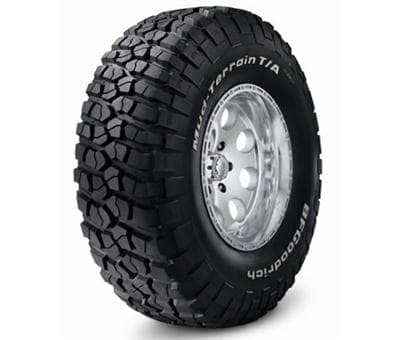 The type of tires that you have on your truck affect the overall drivability of the vehicle and the better the tires are the more you will be able to accomplish each day. Good quality pickup truck tires will allow you to take on everyday driving tasks as well as light off-road challenges. Here are a few of the best truck tires available on the market today according to sales and customer reviews. The BF Goodrich brand is known for manufacturing high quality tires and this all-terrain pickup truck tire is no exception to the rule. It features a distinctive sidewall style that will provide your ride with a bold and daring look. The unique ShoulderLock technology offers up to 40% wider shoulder grooves than other tires in its class that help to increase traction while on, or off the road. These tires can help to keep you safe while driving with rim protectors that help to protect from harmful road hazards and the two steel belts help to increase the overall durability of the tire. This is one of the all time favorite lightwegith pickup truck tires and the new key on off-road design allows complete control while dealing with all-terrain traction. This high quality tire manufactured by Hankook has been designed to provide optimal handling and feedback during the harshest driving conditions. Rugged off-road terrains and intense weather conditions are no match for these exceptional truck tires. The high density nylon belts allow for even delivery of contact pressure and the solid enforced rib block provides the driver with improved braking ability. The extra wide linear grooves in these Hankook truck tires allow proficient water drainage and the jointless bead wire helps to improve the stability of the truck while taking high speeds. Goodyear has always been known for providing superior quality tires and these heavy duty truck tires are some of the best in the industry. They feature a speed rating of 112 miles per hour and provide the driver with a smooth ride no matter what terrain they are driving in. This is one of the more affordable tires offered by Goodyear and is an excellent value for truck owners.